Join Color Management Group, SGIA and GMG with our San Diego and Sausalito Hosts for this amazing learning experience! Learn from the pros how to implement best color management practices. This 2-1/2 day color management "Boot Camp" will prepare you for all of your color battles. You'll learn how to linearize, profile, optimize and verify color on all of your output devices using leading edge RIP technology, all while we're preparing you to take the SGIA Digital Color Professional Certification Program exam (fee included). SGIA recently introduced a new printing industry color certification, called SGIA Digital Color Professional. CMG is partnering with Reynolds Graphic Arts in San Diego and Printform in Sausalito to host this workshop to teach the best methods for color managing printing devices, and preparing attendees for qualification and/or certification in SGIA's program. 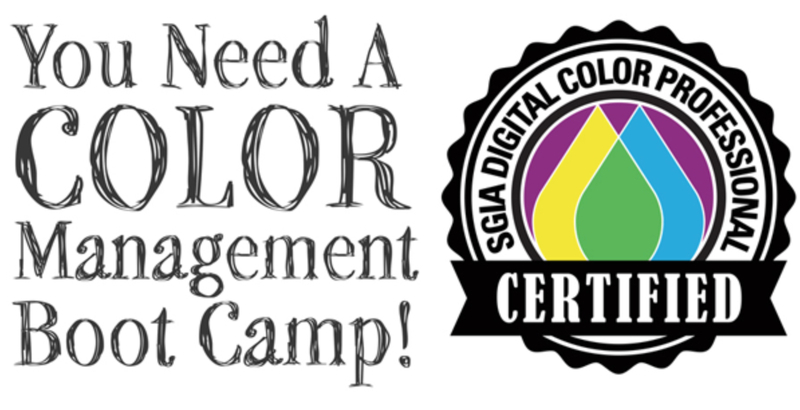 Each attendee will receive a link to take the SGIA Digital Color Professional Exam, within 2 weeks of the class. Learn from the industry leaders how to maximize your investment, get color right the first time, and stop wasting time and money. There will be limited seats available, so Register NOW! The SGIA Digital Color Professional Certified Instructors for this event are Ben Starr (Color Management and Workflow Expert - Color Management Group) and Ray Weiss (Director of Digital Print Programs - SGIA). Ben and Ray offer a combined 49 years of printing and color experience and are both long-time G7 Experts – as well as being certified on many other color management, RIP and workflow related products. Meet your SGIA Certified Instructors: Ben Starr and Ray Weiss. Please make sure to provide all of the attendee's contact information when checking out. Minimum class size requirements must be met 1 week prior to workshop start date. There is a 10 attendee minimum in order to hold this workshop. Please DO NOT make your travel plans until class size is confirmed, you will be notified via email. You will receive a full refund if minimum class size is not met and the class is cancelled. No refunds for cancellations within 1 week of scheduled class start date.